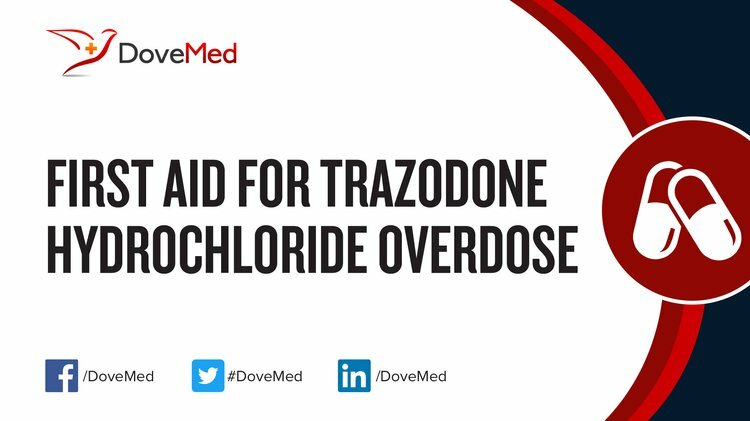 Trazodone Hydrochloride Overdose is the accidental or intentional intake of the drug in dosage higher than prescribed values. What is Trazodone Hydrochloride Overdose? What are the Causes of Trazodone Hydrochloride Overdose? What are the Signs and Symptoms of Trazodone Hydrochloride Overdose? The signs and symptoms of Trazodone Hydrochloride Overdose can vary from one individual to another. It may be mild in some and severe in others. Several systems of the body, such as the respiratory system, nervous system, and vascular system may be affected. How is First Aid administered for Trazodone Hydrochloride Overdose? Who should administer First Aid for Trazodone Hydrochloride Overdose? First aid for Trazodone Hydrochloride Overdose is administered by healthcare professionals. What is the Prognosis of Trazodone Hydrochloride Overdose? How can Trazodone Hydrochloride Overdose be Prevented? Ammar, R., & Al-Warthan, A. (2011). Ion selective PVC membrane electrodes for the determination of trazodone hydrochloride in pharmaceutical formulation. Journal of Inclusion Phenomena and Macrocyclic Chemistry, 69(1-2), 287-293. Gruen, M. E., Roe, S. C., Griffith, E., Hamilton, A., & Sherman, B. L. (2014). Use of trazodone to facilitate postsurgical confinement in dogs. Journal of the American Veterinary Medical Association, 245(3), 296-301. Tatari, F., Farnia, V., Nasiri, R. F., & Najafi, F. (2010). Trazodone in methandone induced erectile dysfunction. Iranian journal of psychiatry, 5(4), 164. Ghosh, S., Venkatesh, S., & Ravikumar, B. V. V. (2015). Development of stability indicating RP-HPLC method and validation for the estimation of vilazodone hydrochloride. International Journal of PharmTech Research, 7(1), 204-211. Chen, C. J., Tseng, Y. H., Chu, F. H., Wen, T. Y., Cheng, W. W., Chen, Y. T., ... & Wang, S. Y. (2012). Neuropharmacological activities of fruit essential oil from Litsea cubeba Persoon. Journal of wood science, 58(6), 538-543. Barbosa, R. (2010). Ferramentas sociais e tecnologia assistiva. Anuário da Produção Acadêmica Docente, 3(6), 157-168. Subbarao, J., Rambabu, R., Vidyadhara, S., Ram, D. J., & Tejaswini, K. (2015). Method development and validation for the estimation of trazodone HCl by UV spectroscopy in pharmaceutical dosage form. Int. J. Biol. Pharm. Res., 6, 68-72. Shoaibi, Z. A., & Gouda, A. A. (2012). Extractive spectrophotometric method for the determination of tropicamide. Journal of Young Pharmacists, 4(1), 42-48. Gervais, S., Smith, D., Rahmouni, M., Contamin, P., Ouzerourou, R., Ma, M. L., ... & Soulhi, F. (2010). U.S. Patent No. 7,829,120. Washington, DC: U.S. Patent and Trademark Office.